Inform and energize your audience with these engaging worksheets and quizzes. This collection of quizzes, worksheets and fact sheets helps people take control of their health through appropriate nutrition, fitness and mental health habits. 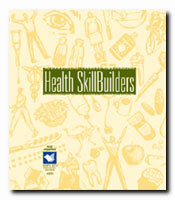 Health SkillBuilders was designed to involve and educate individuals in identifying and improving health attitudes, skills and behaviors. This is a complete tool for health education that works! Daily Values-What Do They Mean? What Turns on Your Appetite? For Exercise Injuries-Have Some R.I.C.E. How Stressed Is Your Family?